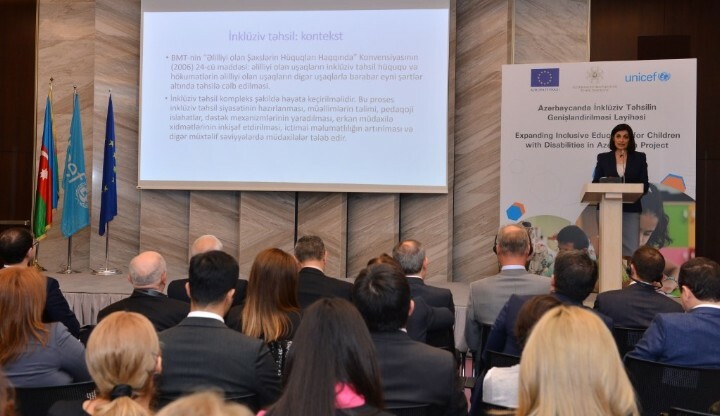 “Expanding Inclusive Education for Children with Disabilities in Azerbaijan” joint project of the European Union, UNICEF and Ministry of Education were launched. Participants in the ceremony included Minister of Education Jeyhun Bayramov, UNICEF Representative in Azerbaijan Edward Carwardine, Head of the Delegation of the European Union (EU) to Azerbaijan Kestutis Jankauskas. Addressing the event, Minister of Education Jeyhun Bayramov highlighted positive changes achieved in the education system over the five years since the adoption of the “State Strategy for the Development of Education in the Republic of Azerbaijan”. The minister said the reforms allowed to improve the quality of education. 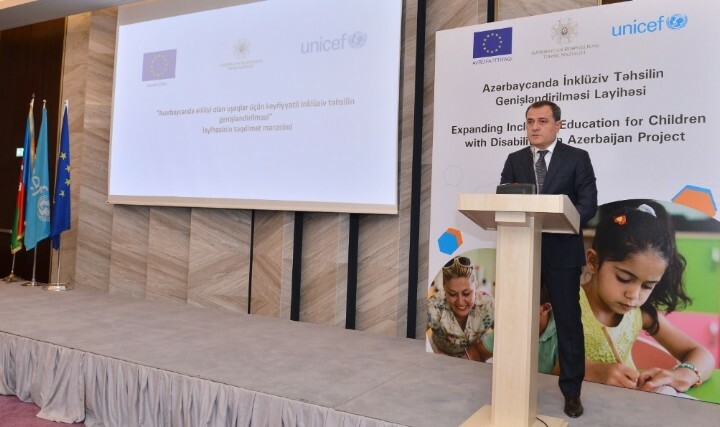 The minister said that UNICEF and Heydar Aliyev Foundation’s “Regional Development” Public Union are now co-implementing two projects funded by the European Union. He said that implemented by UNICEF Azerbaijan, “Expanding Inclusive Education for Children with Disabilities in Azerbaijan” project will see the organization of trainings in order to improve inclusive education skills of teaching staff at pedagogical universities and general education institutions, creation of nine resource centers in Baku and other districts of the country, implementation of public conduct and social change campaigns in order to increase awareness of the rights of children with disabilities. The minister said the project will contribute to the successful implementation of the relevant State Program. 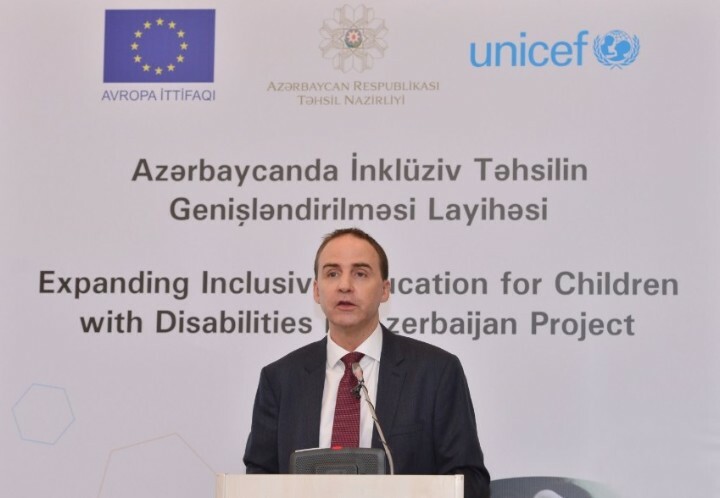 UNICEF Representative in Azerbaijan Edward Carwardine said involving children with disabilities in quality education has a positive impact on their development. He said UNICEF is pleased to partner with the Ministry of Education and the European Union in implementing this initiative that offers children with disabilities opportunity to fully realize their potential. Head of the Delegation of the European Union to Azerbaijan Kestutis Jankauskas highlighted the importance of inclusive education. He said everyone has the right to be involved in public life with knowledge and skills he or she gained, to receive inclusive education and to be involved in training. The inclusive education programs will benefit more than 10,000 school teachers and principals. The project will give nearly 5,000 children with disabilities access to education at general education institutions by 2020. It should be mentioned that 10130 children with disabilities were involved in special education in the 2017-2018 academic year. “State Program for the Development of Inclusive Education for Children with Disabilities in the Republic of Azerbaijan in 2018-2024” already started to be implemented.